Anritsu MP1800A : Signal Analyzers - Test Equipment Connection - Si es de comprar, venta o reparar, Test Equipment Connection es su solucion para todo sus necesidades. 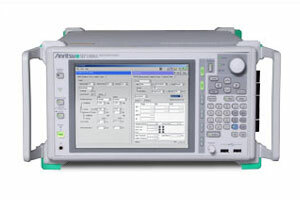 The Anritsu MP1800A and MT1810A, Signal Quality Analyzer (SQA) series, are versatile Bit Error Rate Test Systems (BERTS) for multi-channel BER measurement up to 12.5 Gbit/s and provide various signal analysis capabilities. Additionally, it can be used to perform BER tests up to 50 Gbit/s by combining two MP1800A units with a MUX/DEMUX and synthesizer. A full line of five plug-in modules and various other options support configuration of a flexible test system matching the application. With slots for six modules, Windows®* XP GUI, keypad and rotary encoder, the MP1800A is designed for the R&D market; the less expensive MT1810A has four slots and can be controlled via Ethernet from an external PC running dedicated control software. It is idea for manufacturing and inspection. Using the MP1800A series with installed MU181000B, MU181000A/B-001, and MX180005A makes it easy to configure an automated system for measuring Jitter Tolerance of multi-channel CPU boards, PC boards, and optical devices forming interconnects in routers, servers, super computers, etc. Up to four channels can be measured in one-quarter the time of previous setups, greatly improving the efficiency Jitter Tolerance tests --- which have been a measurement bottleneck in speeding-up interconnect compatibility tests. The MP1800A Signal Quality Analyzer series support automatic multi-channel measurement of Jitter Tolerance of CPU boards, PC boards, optical devices, etc., forming interconnects in routers, servers, super computers, etc., and eliminating bottlenecks in speeding-up interconnect compatibility tests. *Windows is a registered trademark of Microsoft Corporation in the USA and other countries. Any wavelength from 850/ 1310/ 1550 nm is supported. 43.5 Gbit/s BERTS can be configured when used in combination with the Anritsu 43.5 Gbit/s MUX/DEMUX.